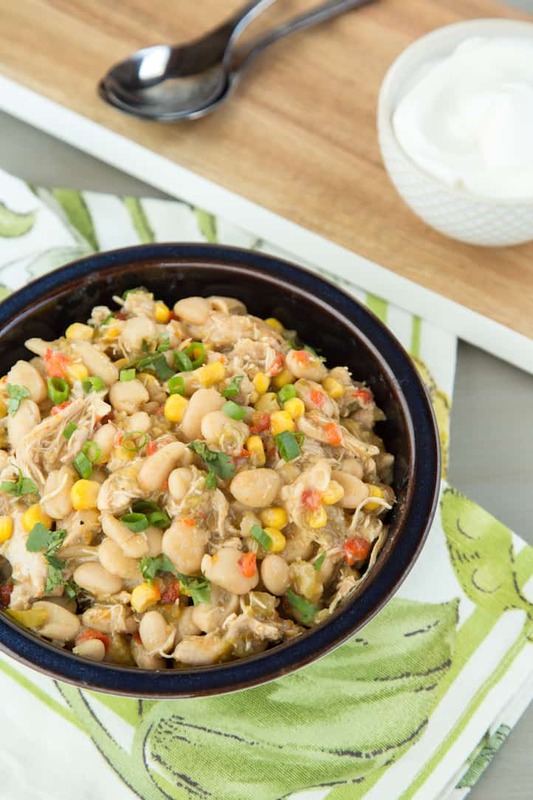 White Chicken Chili for the Instant Pot—Or Not! | Good. Food. Stories. There are infinite ways to make chili, and people constantly fight over debate which is the best, most definitive recipe. All the beans! No beans! How about bison or elk? What’s happening over there in Cincinnati? I’m easy—if you put virtually a bowl of any chili iteration in front of me, I’ll spoon it up happily. But if I’m being honest, I love white chicken chili leaps and bounds over all the other combinations in the cook-o-sphere. And it would be pretty obvious how much I love white chicken chili if you could tally up the many variations on this theme I’ve made over the years. For me, the chili canvas is a bigger blank slate for playing with flavor than the meatier, more tomato-centric versions. 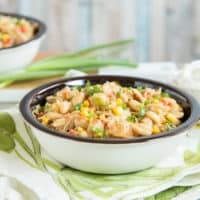 There are always a few must-haves: chicken thighs instead of chicken breast, corn per my husband’s request, and always a base of onions, garlic, celery, and bell pepper—but everything else is up for experimentation. Over the years, everything from cans of Ro-Tel and tomatillo salsa to fresh cherry tomatoes and tomatillos to fire-roasted chiles and pan-charred fresh corn has made its way into the rotation, and all of these have yielded a damn good pot of chili in their own way. Lately, instead of fussing with ingredients, I’ve just been throwing everything into the Instant Pot instead of into my stalwart Dutch oven. If you don’t have an Instant Pot yet, no sweat! 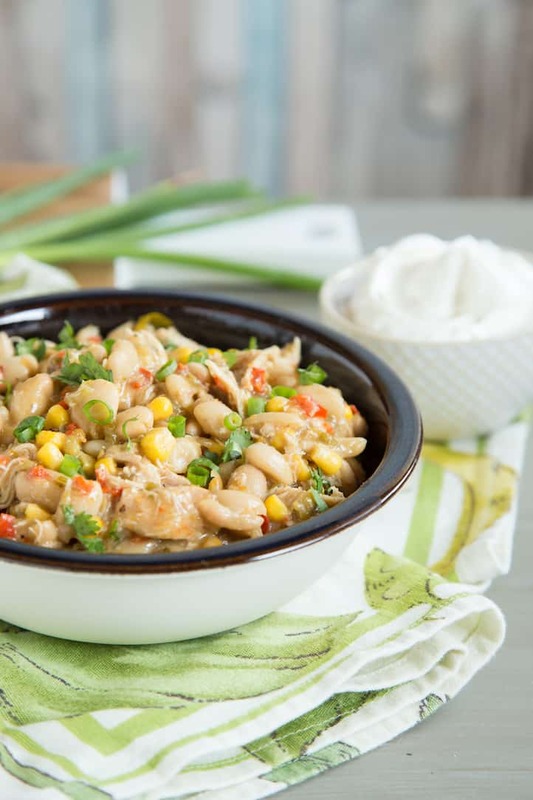 You can still make this white chicken chili on the stovetop—I’ve got instructions for both methods in the recipe below. But what’s the benefit of cooking your chili in the Instant Pot vs. making it on the stovetop? Basically, it comes down to hands-off time. The Instant Pot is a set-it-and-forget-it machine, whereas on the stove, you gotta check in from time to time to give the chili a stir, note how much liquid it’s absorbing, and adjust the temperature or add broth to get it the way you like it. I’m a control freak, so adapting some of my favorite recipes for the Instant Pot has been a trial and error process—especially since I’m adamantly opposed to the watery, over-soupy texture of many dishes cooked in a slow cooker and am constantly trying to rectify that issue. You’ll notice in the chicken chili recipe below that I don’t add nearly as much broth to my Instant Pot chili as I do to the stovetop version. While you should always make sure there’s enough liquid in your recipe to allow steam to build up under pressure, there’s a lot of water already locked inside the chicken, beans, and corn in this recipe that will become part of the flavorful sauce as the chili cooks. And hey, go right ahead and tweak this recipe with your own ingredient additions or substitutions. That’s the beauty of white chicken chili. It’s yours to play with and bring in your own preferred flavors. 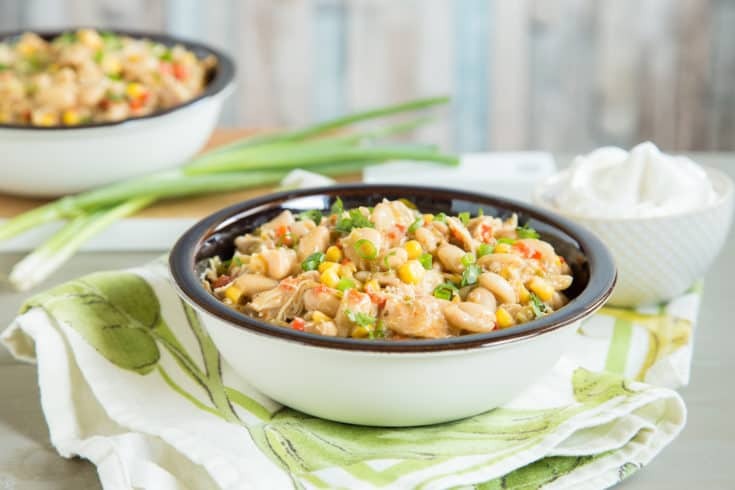 You can make this versatile, flavorful white chicken chili on the stovetop or in your Instant Pot—either way, you'll have a completely satisfying and comforting one-pot meal. Press the Saute button, then press the Adjust button until the display light moves to Less. Let the Instant Pot heat until the display reads HOT. Add the olive oil and heat for a few seconds, then stir in the onion, celery, garlic, and bell pepper. Cook, stirring occasionally, until the vegetables are tender and translucent. Stir the salt, cumin, coriander, and black pepper together in a small bowl, then stir into the vegetables, making sure they're evenly coated. Cook for 30 seconds to 1 minute more to let the spices bloom. Press the CANCEL button to turn the Instant Pot off. Add the chicken thighs, beans, corn, green chiles, and 2 tablespoons cilantro. Stir to combine. Place the lid on the Instant Pot and make sure the valve is set for sealing. Press the Bean/Chili button, then press the Adjust button until the display is set for 40 minutes. When the Instant Pot has completed its cooking cycle, carefully turn the valve to venting and release the pressure. Heat the oil in a large (7-quart) Dutch oven or other heavy-bottomed, lidded pot over medium heat. Stir in the onion, celery, garlic, and bell pepper. Cook, stirring occasionally, until the vegetables are tender and translucent. Add 3 cups chicken broth, cover, and bring to a simmer. Continue to simmer for 45 minutes to 1 hour, until the chicken is tender enough to split apart with a fork. If the chili absorbs the broth too quickly while cooking, add more to keep the chili at your preferred consistency of soupy/stewiness. Equipment Note: My Instant Pot recipes are tested using the Instant Pot 6-quart 7-in-1 model, but any 6-quart or larger programmable pressure cooker can be used with this recipe. Just be aware that the function buttons may be labeled differently on other brands, so you'll need to adjust for your specific model.